Vintage style Christmas lights have all the benefits of advanced technology while still retaining the classic charm of yesteryear. But just where did all that charm come from? Before strings of Christmas lights became a ubiquitous holiday decoration seen in homes across America and the world, they had a somewhat rocky beginning with one of history's most famous inventors -- you've probably already guessed who! Thomas Edison, inventor of the first practical light bulb, is also the man who brought to life the first strand of electric lights. This strand of lights was hung around the outside of Edison's Menlo Park Laboratory during the holiday season and gave passing railroad travelers their first glimpse of an electric Christmas lights display. 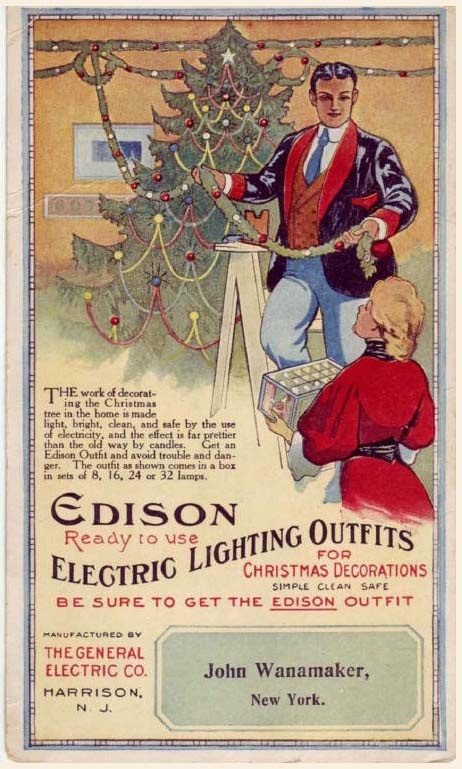 Two years later in 1882, Edison's friend and business partner, Edward H. Johnson painstakingly wired 80 red, white, and blue bulbs together by hand and then wrapped them around his revolving Christmas tree, effectively creating the very first strand of Christmas tree lights. Prior to the use of electric Christmas lights to illuminate the tree, families decorated with live candles which were dangerous and the cause of many house fires. Thus, Johnson's Christmas tree lights were an impressive advancement in design and safety, however there was still an overwhelming amount of distrust for electricity at that time. Assembling a strand of electric lights was also incredibly expensive and required hiring a "wireman" or electrician, which was something only the most wealthy members of society could afford. Due to the cost and uncertainty surrounding this new lighting application, it wouldn't be until 1903 when the first pre-assembled set of Christmas lights was created by General Electric to be sold to the average consumer - and as they say, the rest is history! Bring the charm of Christmas past into your present and future with vintage Christmas light styles featuring modern innovations! C7 & C9 light bulbs first appeared in the Christmas market sometime around the 1920s. Prior to that time, a smaller C-6 bulb and another similar bulb shape commonly referred to as "pinecone" lights were available. 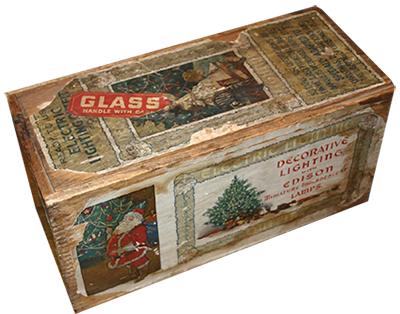 Most early incandescent Christmas light sets featured painted bulbs that provided a soft glow, however some were transparent, allowing the glowing filament to be visible through the glass. Paint did not adhere well to earlier bulbs and often chipped or faded within one or two years of use. 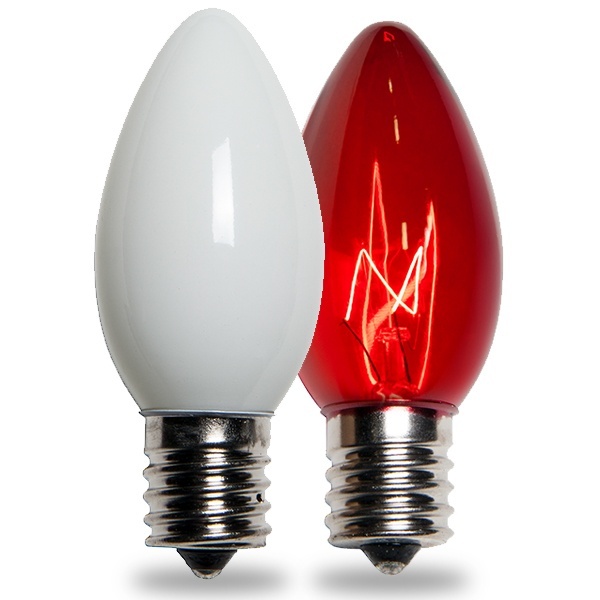 Present day incandescent painted (opaque) and colorful triple dipped transparent C7 & C9 Christmas light bulbs are much more durable. 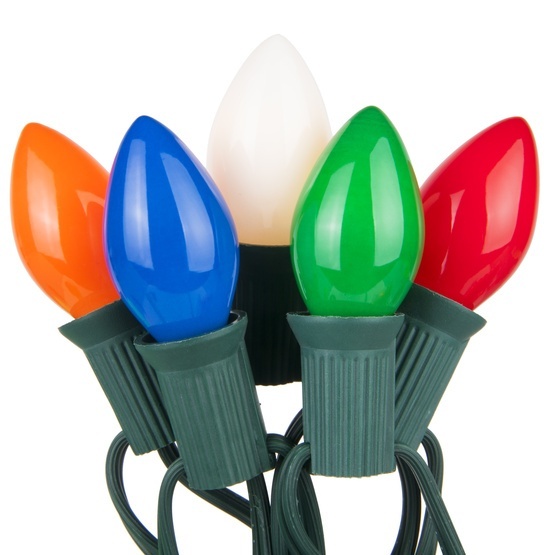 C7 bulbs were originally used to wrap indoor Christmas trees, however as waterproof Christmas light sets were created, C7 & C9 bulbs became popular in outdoor applications as well. Common uses for C7 & C9 lights today include lining the roof and walkways, as well as wrapping indoor and outdoor trees. As technology has advanced, a new energy efficient and long lasting type of light bulb has come to market in the form of Light Emitting Diodes (LEDs). 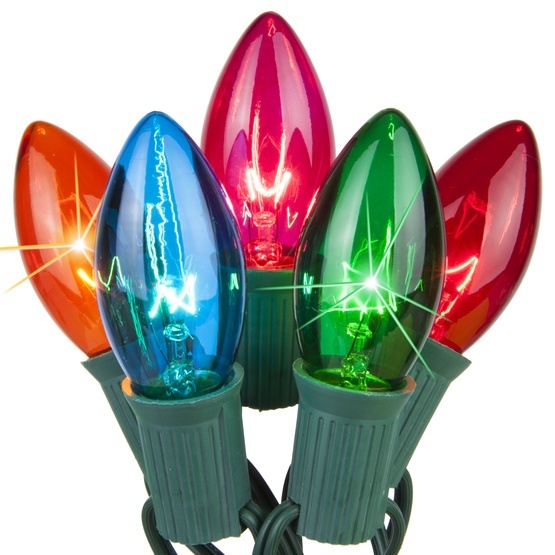 LEDs are recent to Christmas light's history with the first being invented in the early 1960s. When LED Christmas lights first made their way into consumer's homes, many people loved them for their vivid light output, energy efficiency and incredibly long life as compared to traditional incandescent Christmas lights. Despite these technological advancements, there was still some work to be done in making LED bulbs an aesthetic rival of incandescent lighting. 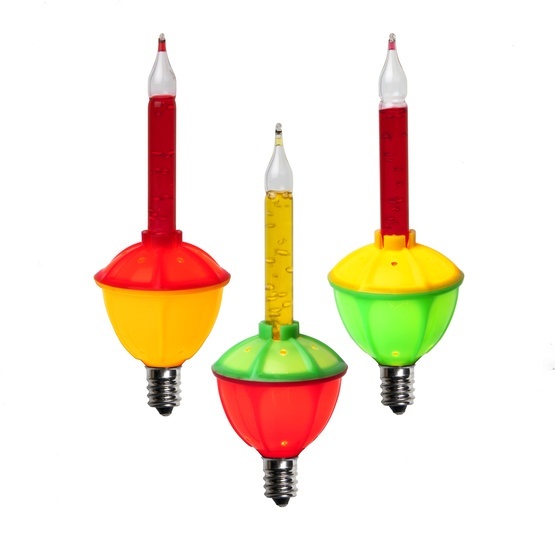 Vintage Christmas light enthusiasts were not initially in favor of the new LED bulb style as it did not provide the warm glow and nostalgic visible filament display that is characteristic of incandescent lighting. However, in very recent years some magical new advancements have occurred in the design of C7 & C9 LED Christmas light bulbs and enthusiasts are beginning to see LEDs in a new light. For the decorator who wants the colorful and smooth appearance of painted incandescent bulbs, OptiCore™ smooth opaque LED bulbs produce a diffused glow and are infused with color, which means no paint and no chance for bulb colors to fade, chip or crack! If transparent incandescent bulbs are your preference, take a look at the newest style of LED bulbs called FlexFilament™ LEDS. They're designed to mimic vintage style visible-filament lights by using a curved LED filament which can be seen through a transparent acrylic or glass bulb lens. This visible filament LED bulb design is also available in Edison style light bulbs and globe lights which are very popular for events, home illumination, and patio lighting. Possibly the most widely recognized of all Christmas lights is the mini light bulb, and for good reason. These flexible miniature lights can be wrapped around almost anything - Christmas trees, columns, garland, wreaths, staircases, window frames, outdoor tree trunks, bushes and crafts, just to name a few. The ever popular incandescent mini light is still the preferred choice among many households today, however the short life span and elevated power needs of incandescent bulbs have caused even more families to make the switch to LED mini lights. 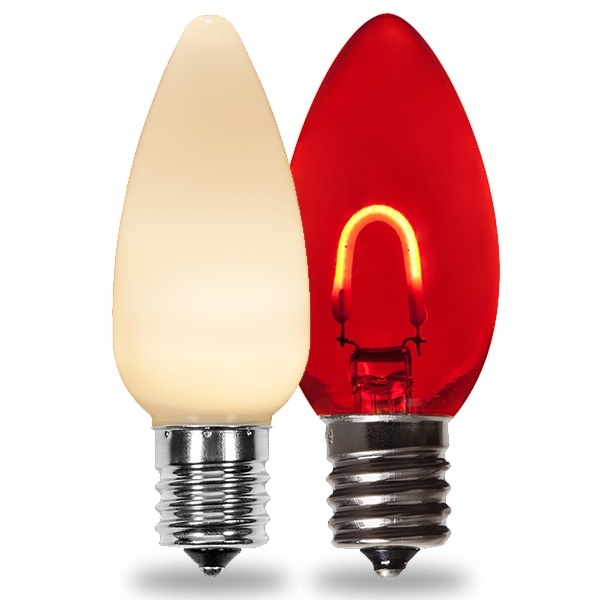 There are several types of LED mini lights from wide angle 5mms to faceted M5s, but up until recently none of these options quite captured the warm glow and classic shape of traditional incandescent mini lights that vintage Christmas light enthusiasts love - none that is until the T5 LED mini light was created. T5 LED mini lights are designed with the exact same bulb shape as traditional incandescent mini lights. T5s also have a longer lifespan than incandescent mini lights (100,000 hours vs, 3,000 hours) and you can connect up to 45 sets of 50 count T5 LED mini lights together, whereas you can only connect about 10 sets of comparable incandescent lights together. This ability to connect more sets end to end makes wrapping trees and outdoor areas easier by reducing the number of plugs and extension cords needed while minimizing the chance of blown fuses and bulbs. In the 1940s a New York accountant named Carl Otis came up with the idea for a bubbling, candle shaped set of Christmas lights. The captivating lights he envisioned were brought to life with the help of NOMA Electric Corporation and given the name "Bubble Lites" - quickly becoming the must-have Christmas light of the 1950s and bubbling merrily on Christmas trees in family homes across America ever since. Early versions of the bubble light were filled with an oil mixture which was later replaced with tinted Methyl-Chloride, a chemical that has such a low boiling point it can bubble in the sunlight! Today's modern bubble lights feature glass tubes and an art deco style base design, similar to those first produced by NOMA.